Nevertheless, after a hard days work (my first day back following detox last week) this was delicious. Hearing the chicken sizzling in the pan and smelling all the sweet smells wafting through the kitchen really got my taste buds tingling. And it did not disappoint. 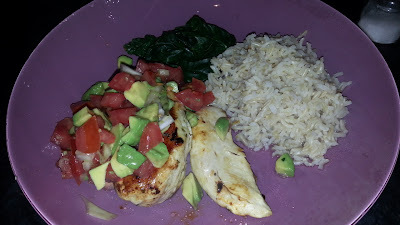 The chicken was pan fried in a lime and coriander marinade, served with avocado salsa, spinach and brown rice. The chicken was cooked perfectly; almost crispy on the outside, tender and juicy in the middle. The avocado salsa is easy to make (Kate informs me), simply chop avocado, tomato and onion and mix with olive oil and lime juice. You know you're eating healthy when you're eating brown rice. I'm still adjusting to the taste and prefer white basmati, but I'm not complaining. The dish as a whole with the spinach (which I think Kate improvised) worked brilliantly and I loved every bit.